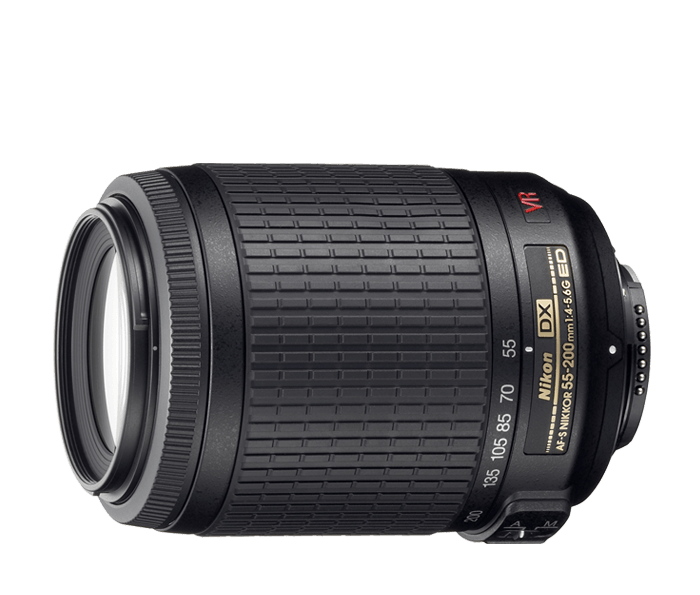 The Nikon AF-S DX VR Zoom-NIKKOR 55-200mm f/4-5.6G IF-ED is an ideal telephoto zoom lens for those seeking a lightweight all-in-one lens or a companion lens for the 18-55mm kit lens that came with their camera. Vibration Reduction (VR) significantly reduces camera shake throughout the entire focal length, making sharp telephoto shots substantially easier to achieve. An ideal lens for sports, people and school events, this lens provides clear images with less blur. This 3.6x zoom, designed exclusively for use with Nikon’s DX-format D-SLR cameras, features Nikon’s VR (Vibration Reduction) image stabilization and is perfect for portraits and action. Nikon VR (Vibration Reduction) image stabilization provides 3.0 stops* of blur free handheld shooting, assuring dramatically sharper still images and HD video capture. The AF-S DX VR Zoom-NIKKOR 55-200mm f/4-5.6G IF-ED is an advanced lens that pushes your DX-format D-SLR to peak performance. A host of Nikon lens technologies offer greater shooting opportunities, even in trying conditions, so you can capture images you never imagined possible.